I’m not doing too well on the mix of recipes (or new recipes – yet!) as all these yummy vegetarian dishes have me looking up ones I haven’t tried in a while! I’m not sure what’s taken me so long to make this Butternut Squash and Bean Crumble again, as it was absolutely delicious! 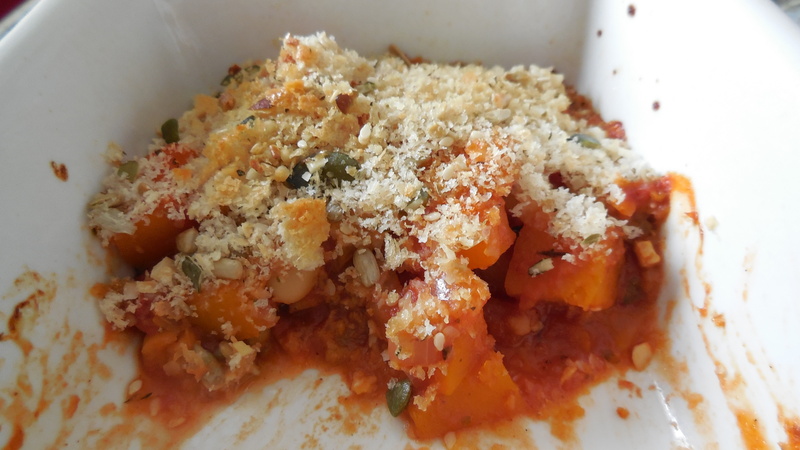 I do love butternut squash, and the mix of the wine and tomatoes is a lovely base. 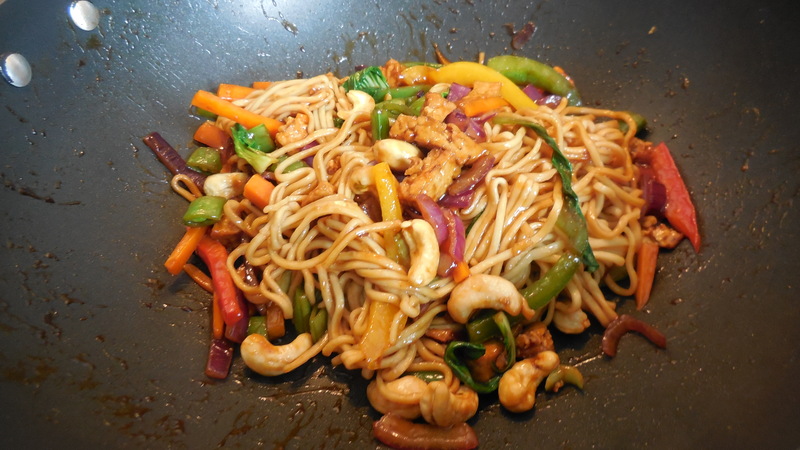 The chilli surprised me a little, but it works – I used a level teaspoon, and wouldn’t want it any hotter. I might, however, have to try butter beans (lima beans, I think?) next time, as the cannellini were a bit small and inconsequential in the finished dish. 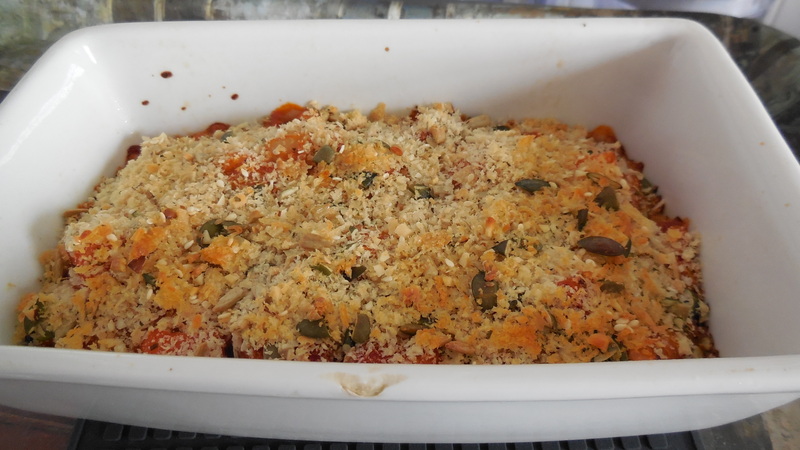 The crumble topping is one I intend to try on other things: the breadcrumbs went lovely and crispy, and my experiment of adding some mixed seeds (pumpkin, sunflower, sesame) added some lovely crunch and colour – I’ll be doing that again! My one concern about this recipe is portion size. I remembered the first time I made this ended up with just HUGE portions (perhaps I misread the original recipe‘s 6 portions and thought it was 4?). This time, I halved the recipe – and please don’t worry, I have a great way to use up the other half of the squash! – thinking it would make four decent portions, instead of three huge: instead, I must confess that my version of the recipe gives more of a lunch portion than main course (although: perfect excuse for dessert!). I ended up eating 2/3rds of the half I cooked (the other half is in the freezer), and will throw some salad together with the remaining third for tomorrow’s lunch. It was really hard to stop here and leave some for tomorrow’s lunch…! Happy Easter! To balance out all that chocolate (I suspect!) the supermarkets have all had offers on their fresh veg this past week, so an excellent time to stock up on soup ingredients. And to balance out all that chocolate (I know! 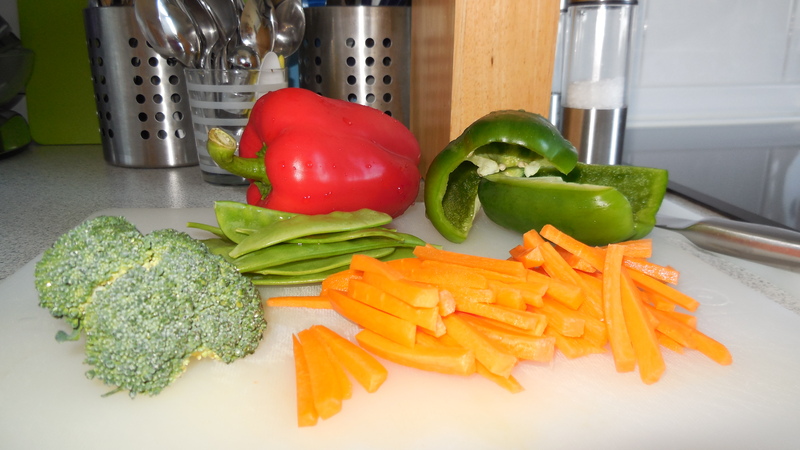 ;)) a perfect time for some more veggies-as-main-courses, too. 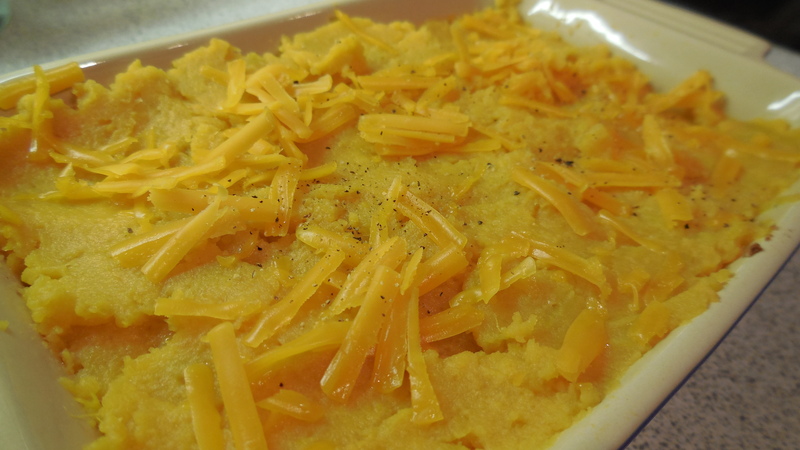 This Veggie Shepherd’s Pie is a perfect healthy and hearty, warming dish with the added benefit of a whole lot of flexibility! Make it all at once, freeze it, or make the sauce separately and add fresh sweet potato when you’re ready to eat. I made this a month ago, eating a single portion of the four. This can feel like a long-to-make meal – it’s not really, but anything with more than one step can be too much effort, right? 😉 Making the sauce – chop carrots and bung stuff into a pan for a while; making the topping – if you dice the sweet potato it cooks in 15 minutes or less; and finally assembling (tip: press the mash on rather than trying to spread it, which moves the base in a messy way) and baking. The other three portions of the sauce base went into the freezer (in individual portions) so today I could defrost the sauce and use up one of my fresh bag of sweet potatoes (the rest went into a Sweet Potato and Chilli soup – nom!). I both defrosted and heated the base in the microwave, so it was warm under the new mash, and the whole thing only took 20 minutes in the oven, and around 40 minutes total. Had I cooked the whole thing from frozen, it would have taken 40 minutes in the oven, so either approach has benefits. At least this way I didn’t have to find quite as much space in my freezer, and didn’t ‘lose’ a dish in the meantime! I’m sure I could find other uses for that base sauce – it’s very tasty! It’s also a great way to use up carrots, and – as the recipe notes say – the secret to this dish is making sure you leave a little firmness and ‘bite’ in the carrots, rather than letting them cook to mush. 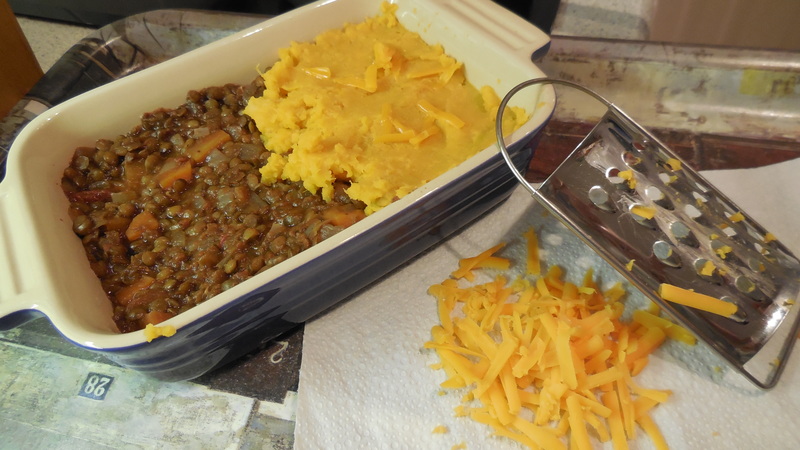 The green lentils also add to the heartiness, while just a small amount of red lentils soak up any extra juices. I’d recommend the sweet potato over regular – in fact, I may have to try that more in general, as it is a healthier choice – as it goes so well with the flavours here, adding that bit of sweet to the red wine and herb richness, and the slight tang from the cheese sprinkles.